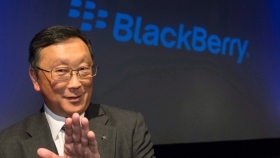 TORONTO — BlackBerry Ltd., a company increasingly focused on technology for the self-driving vehicle market, is making an inaugural visit to North America's biggest auto show in Detroit, where CEO John Chen's team says the company will debut a new product on Monday. Over the past five years, the chief executive gradually reduced the Waterloo, Ont.-based company's dependence on smartphone sales in a crowded market and repositioned the company formerly known as Research in Motion as an innovator in cybersecurity and software. Chen sees BlackBerry's first appearance at the North American International Auto Show (NAIAS) — one of the global industry's major annual show-and-tell events — as the next stop on his roadmap for the company. "With cybersecurity increasingly a focus of automakers and regulators alike, our invitation to address NAIAS is a reflection of software's primacy in vehicles and our position as a cybersecurity leader," said Chen, who is also BlackBerry's executive chairman. The company has a lot riding on its BlackBerry QNX division, a formerly independent Ottawa-based software developer that's made inroads with Ford Motor Co. and automotive suppliers around the world. It's possible that BlackBerry will be able to make a dent in the global auto industry by embedding its software into the next generations of automated vehicles, but it is still early days in that market and too soon to tell whether it will succeed. "I do think they are a top contender [in this field], especially for Canada," said Alexandra Cutean, director of research for the Information and Communications Technology Council, an Ottawa-based think-tank. Her research shows the German and American automotive sectors are considered world leaders. Sweden, the United Kingdom, Japan, France, China, Italy and South Korea are also in the race. "By comparison, Canada's approach to audiovisual technology development, as well as progress in intelligent transport altogether, has been slow," said Cutean, author of a recent report on Canada's automated vehicle industry. But she did note that BlackBerry conducted Canada's first driverless car trial in October, a significant development for the country's field. The world's automakers may need to work quite closely with technology companies, she said, to ensure there aren't potential threats from having third-party parts installed in the vehicles. "We may see more collaboration, just as result of the necessity of this type of technology being integrated with vehicles." BlackBerry is a good example of how parts makers are now creating critical components and core elements of vehicles, said Sabrina Bond, who wrote the Conference Board of Canada's 2018 report on the auto industry. Other examples include Canada's two largest auto parts makers Magna International of Aurora, Ont., and Linamar Corp. of Guelph, Ont., she said. "You might see Chinese, Japanese, North American and European parts all integrated into one vehicle in a way that we may not have seen before." In fact, BlackBerry has been busily making friends at every level of the auto industry's food chain: electronics chip makers, Tier 1 parts suppliers and automakers. Among its major partners is Ford, which agreed in October 2016 to expand the use of BlackBerry's QNX Neutrino operating system, Certicom security technology, QNX hypervisor and QNX audio processing software. A few weeks later, BlackBerry was showing off a Jaguar XJ concept car with a new digital cockpit design that combines the infotainment and instrument cluster functionality at the 2017 Consumer Electronics. Since last fall, BlackBerry has announced various arrangements with some of the world's most important semiconductor companies, including Delphi, Visteon, Qualcomm, Denso, and Nvidia. On Jan. 3, Chinese search engine giant Baidu Inc. chose BlackBerry's QNX safety operating system as a foundational piece of the Apollo autonomous driving system, being developed with three Chinese OEMs. Last week, at the 2018 consumer electronics show, BlackBerry used two concept cars from Aston Martin and Range Rover as tangible illustrations of how its QNX software can be used.